When you litigate a divorce in Colorado, you file your lawsuit in family court. Let’s explore and define some of the most commonly used legal jargon related to civil litigation. 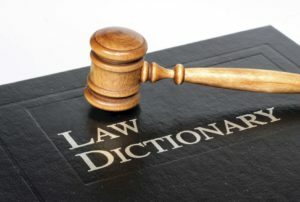 Below, we have defined several key terms and ideas you may hear during the course of your divorce case. ADR: Alternative dispute resolution, the “umbrella term” for techniques like mediation and arbitration. These approaches are frequently used to help resolve issues or cases without going to trial. Alimony: Support fees paid by one spouse to another. Called “spousal maintenance” here in Colorado. Child support: Financial support for a child’s basic needs, like food, shelter, education, and healthcare. Court order: A written document issued by a court. It becomes effective when signed by a judge, and it may require one or both parties to do (or stop doing) certain things, like paying support. Custody: The legal right and responsibility to care for and raise a child. Custody is often split into “physical” custody (which governs where the child lives, among other things) and “legal” custody (which concerns who makes big decisions for the child regarding things like religious upbringing, medical care and schooling). Default/default judgment: A court order or judgment entered without hearing one side, because that side failed to meet an obligation (like appearing at a hearing) in the allotted time. Equitable distribution: A system of distributing property that attempts to leave both spouses on an equal footing, based on items like health, education, employment, and other prospects. Grounds: The legal reasons for granting a divorce. Hearing: A court proceeding to resolve disputed issues. May involve witness testimony, evidence, or legal arguments. Marital settlement agreement: The agreement between the parties as to how to divide the marital property. May also include issues of support or custody. No-fault divorce: A divorce in which neither party has to prove misconduct by the other. Set off: One spouse’s debt is deducted from the debt of the other spouse. Temporary/”pendente lite” motions: A request that the court provide relief while the divorce case is ongoing, or for a limited amount of time. The experienced Colorado divorce attorneys at the Gasper Law Group can help you understand these and other key terms and use the ideas behind them effectively. To learn more, call our firm today at 719.227.7779 to schedule a free, confidential consultation.